How does the shape of the spine change from birth to adulthood? 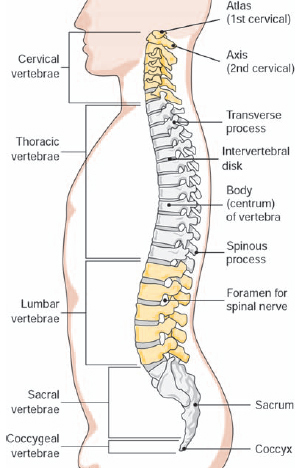 The spine of a newborn infant forms a continuous convex curve from top to bottom. At about three months of age, a concave curve develops in the cervical region as a baby learns to hold up his or her head. When the baby learns to stand during the second half of the first year of life, a concave curve appears in the lumbar region. The thoracic and sacral curves remain the same throughout the life of an individual. These are considered primary curves, since they are present in a fetus and retain their original shape.